When logging back into my blog after my long blogging hiatus, one thing I noticed is that my various posts about Logic of English are still getting frequent visits. We’re still using and benefiting from Logic of English, and I feel like I have learned as an instructor how I can better use the Logic of English techniques and curricula with my students. I’ll pick up in this post where I left off in the last post, which I wrote at the end of the 2012-2013 school year. That year, I had finished up using Essentials with Miss M (a third grader at the time), and had completed most of the beta-test lessons of Logic of English Foundations (we primarily used what became levels B and C) with Mr. E (a Kindergartener at the time). As I had planned, I used the Advanced Lists for Essentials with Miss M (4th grader at the time), and started working through Essentials with the basic lists for Mr. E (a 1st grader at the time). One of the first things that went out the door was the idea of keeping both kids together on the same “week” of the curriculum with different lists. Mr. E wasn’t ready for a full Essentials lesson each week. Had Foundations D been available that year when Mr. E was a 1st grader, it would have been a perfect fit). He had a basic knowledge of the phonograms, but needed more practice at using them. He needed more reading practice with early readers and easy chapter books to gain fluency. But, alas, Foundations D wasn’t published until this school year due to various delays. As it was, I tried my best to make reviewing phonograms and learning the spelling rules fun for Mr. E while we worked through Essentials, and we varied in pace through the year, doing half lessons some weeks and full lessons other weeks. By the end of the school year, we had completed about 25 lessons. He made lots of reading progress through the year as he practiced reading daily, and was spelling more than adequately for a first grader! Miss M had a mixed experience last year with the Advanced Lists for essentials. The advanced lists for Essentials weren’t necessarily designed as a “second year” of Essentials, though they certainly can be used that way. The LoE website describes them as an “alternate” to the basic lists provided in Essentials. Not having any other ideas of what to do with Miss M for spelling and knowing she needed continued instruction and practice, we gave the “Advanced Lists” a go. Without a doubt, Miss M’s spelling continued to improve as she practiced analyzing and then learning a list of 25 words each week. However, some words on the advanced list were almost too easy or were repeats from the previous year, while other words were quite challenging. “Ice” was too easy, while “Cacophony” was not only a spelling and vocabulary challenge, it was a word that my 4th grader was unlikely to need to read, much less spell, any time soon. I wish I would have realized before the end of the year that 25 words is too long of a list for Miss M in particular. We’ve used much shorter lists for spelling this year (more about that in an upcoming post), and she is much better at mastering new words, however difficult, when she is less overwhelmed by a long list. Meanwhile, Mr. K (who turned 5 in February of 2014), started showing a growing interest in learning to read. Since, as a beta tester, I already had in hand the Foundations materials, I began working through Foundations A with him in January of 2014. He turned out to be a natural at many of the phonemic awareness activities! With very little practice or prompting, he was able to blend, segment and identify beginning, ending and middle sounds. Most of the spring of last school year for Mr. K was spent with me loosely going through Foundations A to teach him the sounds of the first 26 phonograms, then helping him with reading the I See Sam beginning readers. He wasn’t very interested in learning to write, so I decided to save that for Fall 2014, his Kindergarten year. At the end of the 2013-2014 school year, I was definitely pleased with everyone’s progress. But I also knew I needed to take things a little bit of a different direction for Miss M and Mr. E, while at the same time really diving into Foundations B with Mr. K. More on that in my next post! Even though we already finished one 1930s Newbery Award winner for the Newbery Through the Decades challenge in February, I decided we could sneak in one more before the end of the month. Thimble Summer was a quick read, and I hadn’t planned ahead for the next bedtime read-aloud for Miss M and I. The White Stag by Kate Seredy has been on my shelves for quite a while, though I was thinking of saving it for a few months from now to match up with our history studies. But, I’m glad I decided to grab this 1938 Newbery winner to enjoy right now. Over the past year or so I’ve become a huge fan of Kate Seredy’s work. We read The Good Master, The Singing Tree and The Chestry Oak last year as historical fiction to match up with our history studies (We were focusing on American history, but read these European-focused works when we were at the corresponding time periods in our studies). As I impatiently await my very own copy of The Chestry Oak (It has been out of print for many years — we had to get it from ILL, and now it is soon to be reprinted! ), I was getting antsy to read another book by Seredy. As we read The White Stag, I didn’t feel so bad about not waiting until we reach the time of Atila the Hun in our history studies to read this mostly-fictional saga of Attila, his ancestors, and their sojurn across Europe and central Asia. In this work inspired by traditional Hungarian folk tales and mythology, Seredy weaves a surprisingly beautiful story of people migrating and conquering their way to a land promised to them by their god. I’m not sure if these quotes quite convey it when separated from the rest of the text, but Seredy’s descriptive, beautiful language make this story feel like a sweeping epic even though it is told in only 93 pages (including pages taken up with Seredy’s equally beautiful and detailed illustrations). This book is definitely more than worth the short amount of time it takes to read. I had Thimble Summer by Elizabeth Enright on our “to read” list for last spring as we finished up with our second year of American History studies, but somehow we never got around to reading it. So, this was an easy choice for a 1930’s award winner for the Newbery Through the Decades Challenge in February. Thimble Summer was a book I could have easily handed over to Miss M for a quick read, but it was also an enjoyable book to read together. Like other of Enright’s books we’ve read (The Saturdays, Gone Away Lake), the story is gentle and focuses on episodic adventures of children who seem like “ordinary kids” in many ways. Thimble Summer takes place in the 1930s and relates the incidents in one girl’s life over the course of the summer after she finds what she believes to be a lucky thimble. A friend recently told me how she just doesn’t understand what I (and other friends) see in books like this. “They’re pretty boring,” was essentially what she told me. If you are looking for edge-of-your-seat excitement, this definitely won’t be your cup of tea. But, Miss M and I both find very enjoyable to read about what life might have been like for a nine year old girl in a different era — when no security system would immediately betray the presence of two girls locked into the library after hours, and a trip alone to big town down the road (via bus and hitchhiking) would not result in a call to the police. Thimble Summer would make a great addition to a historical fiction reading list for 20th century American History, or just an enjoyable read for anyone who likes sweet, true-to-life stories. 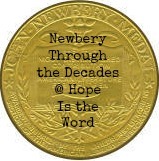 My big inspiration to get back to blogging was Amy’s “Newbery Through the Decades Challenge” @ Hope is the Word. I love reading Newbery award winners and I hope to someday be able to say that I have read every Newbery award winner. Given that I had been having a hard time deciding on books for Miss M and I to read together, the idea of reading one or more Newbery books each month this year sounded like a great idea. Both honor books and award winners are eligible for each month’s challenge. The first book we read for the challenge (back in January…better late than never to blog about it, right?) was Downright Dencey by Caroline Snedeker, a 1928 honor book. While I am aiming to read mostly award winners for the challenge, none of the winners from the 1920s struck me as books I wanted to read with my daughter right now. A couple sounded like they might be of interest to the boys, we’ve already read Gay-Neck, Story of a Pigeon, and I’m saving Trumpeter of Krakow for when we reach the appropriate time in our history studies. That left the honor books to look through, and I chose this one because M often likes books featuring girls about her age. Downright Dencey is set in the Nantuckt island Quaker community soon after the War of 1812. Dionis, or Dencey as she is often called, is a fairly spirited girl who, in a moment of rash anger, throws a stone at a boy who is calling her offensive names. She feels she must seek this boy’s forgiveness, and in her attempt to do so, she gives away a precious books and promises to teach this outcast boy to read. Dencey must be secretive to fufill her promise since her mother would never permit her to spend time with this boy, and she finds herself facing a battle within as she struggles between keeping her promise to the boy and feeling guilt at the lying and deceitful behavior she has to undertake to keep the promise. While I felt like this book was a bit of a slow starter, the action picks up as the story progresses. Dencey faces a number of minor hardships and adventures, and gets in trouble for impulsive behavior and bad choices in a way that reminds me just a bit of Anne in Anne of Green Gables. Quaker religious beliefs figure prominently into the story. I found it interesting to see how the beliefs of Dencey and her family share some similarities to beliefs I hold, while other beliefs are unique and almost puzzling. Miss M gives this book a “thumbs up” as well. Even when I almost thought about giving up on it a couple chapters in, she assured me she wasn’t bored and enjoyed the book all the way through. I think I will try again to blog. No promises on how long this will last or how much I will post though. 🙂 I’ve decided that I miss blogging about books, and using that as a means of keeping track of what we read and how much we like (or don’t like) various books. I don’t miss trying to wrap up every week with lots of pictures, so I probably won’t do that. I might share some thoughts about what we like or don’t like about various curricula we are using. As a family, we are doing history from Creation to the Fall of the Roman empire with Mystery of History as our spine, and we’re using Science in the Ancient World by Jay Wiley for science. Miss M is 10.5 and in 5th grade. She’s using CLE for math (plus Life of Fred Fractions once a week and Xtra math for fact practice) and Treasured Conversations for writing and grammar, as well as Language Mechanic for some grammar and mechanics practice. She already finished Sassafras Science Botany and is reading Quark Chronicles Botany. We are going through the Susan C. Anthony list of Top 1000 words (Spelling Plus/Dictation Resource Book), and marking them up Logic of English-style for spelling. Plus history book basket reading, and read aloud/read alone lit from a list I made. She’s taking guitar lessons and does Bible reading and SOAP journaling every day. She finished a typing program earlier in the year and has had good intentions about doing German with DuoLingo, but hasn’t progressed very far yet. Mr. E is almost 8 and in 2nd grade. He is using Beast Academy for his primary math (he is advanced in math, so we are part way through book 3D right now). He is also doing Spelling Plus/Dictation Resource book in an LoE style for spelling, and we are slowing going through Getting Started with Latin…both for learning Latin and for some light grammar. I’ve been using English Lessons through Literature 1, though he hates the copywork so we dropped that early on. We also started the year with him doing Elson Readers for reading, but now I am letting him choose books for free reading and having him read a minimum of 20 minutes per day. We also do daily Bible reading and sometimes SOAP journal writing during our school time. Mr K turns 6 on Friday and is in Kindergarten. 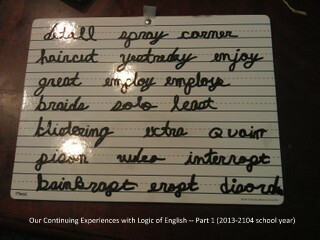 He is doing Logic of English Foundations for reading/spelling/handwriting (we are a few lessons into book C). For math, we finished up Singapore Essential K book B back in November, and decided to try out Miquon for him since he loves cuisinaire rods. We’re using parts of the Orange and Red books. He also listens in for English Lessons through Literature and Bible reading.